On 03/05/03 Dwayne Verhey (aka Torch) from the FJROwners online forum wrote this Web page describing how to install "Riv-nuts" into the Yamaha FJR1300's header pipes. This is required to properly modify the EFI's CO setting, like the European and OZ/NZ models allow. Note: there are companion Web pages documenting how to do the Barbarian Jumper mod and how to adjust the CO setting. 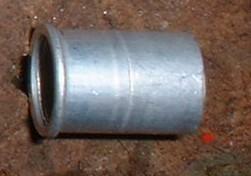 These are riv-nuts (or rivet nuts, or thread inserts depending on the manufacturer.) 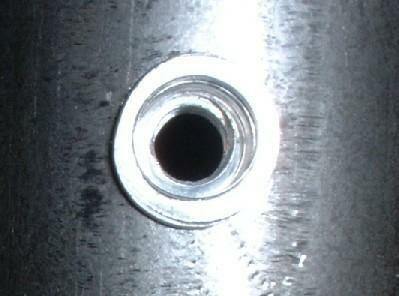 They are a hollow, threaded rivet that can be installed on the headers "blind" -- that is, without removing the headers. Yamaha instructs North American dealers to install these if it is necessary to check the CO adjustment of the fuel injection system. This is a riv-nut tool. Similar to a standard pop rivet gun, but with interchangeable adapters and anvils sized for the insert being installed. The appropriate adapter is screwed into the tool, followed by the corresponding anvil. In use the riv-nut is threaded onto the adapter, inserted into the hole, and compressed against the anvil when the handle is squeezed to draw the adapter inwards. After installation, the removal knob is turned counter-clockwise to unscrew the adapter from the insert. 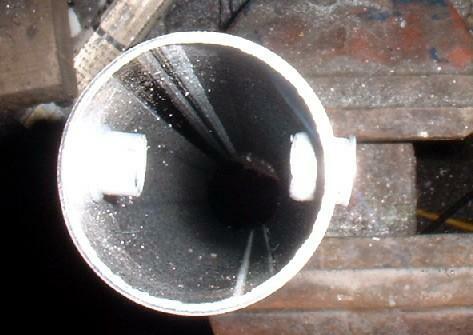 First a hole is drilled into the pipe where the port is required. European and Oceanic models have ports installed from the factory. Migmagal reports they are located "About 5 inches after the cylinder exits on each tube" and Woody concurs saying they are "about 125mm from the top of the exhaust ports". 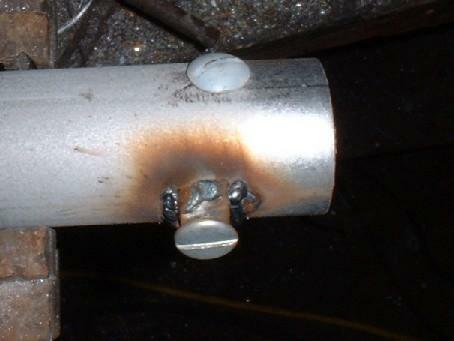 For clarity, these pictures are of a sample installed on a piece of scrap 1 1/2" exhaust pipe. Here the riv-nut is assembled on the tool and inserted into the hole ready to go. One squeeze of the handle is sufficient. 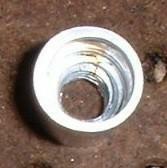 Attempting to compress the riv-nut further will only strip the threads. As described earlier, unscrew the tool from the insert using the removal knob. The end result. The upper portion of the riv-nut has been mushroomed firmly against the wall of the pipe, following the curve, providing a threaded port. I chose 1/4"-20 NCT aluminium inserts for this example. Following this I inserted an oxy-acetelene torch into the other end and adjusted it so flames were shooting out the end past the insert and left it until the pipe started to glow a dull red through most of it's length. The aluminium was unaffected, but I think I would still choose steel or stainless inserts for the real installation to avoid corrosion of dissimilar metals. The hole is sealed with a bolt when not in use. 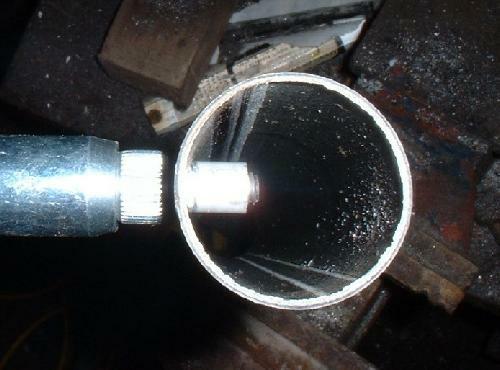 As can be seen from this picture, the bolt may protrude into the pipe unless cut to length. 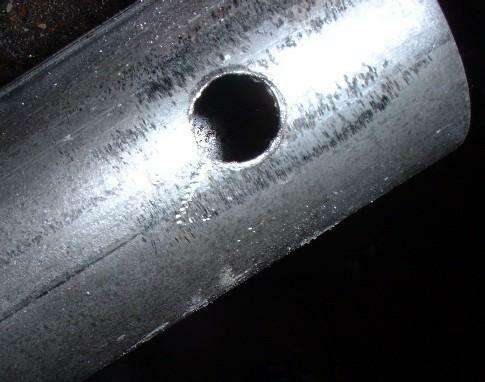 Besides being a potential for further restriction, the exposed threads could become clogged with carbon deposits from the exhaust making future removal difficult or impossible. I suggest trimming the bolt to avoid problems. When cutting a thread, it's a good idea to temporarily install a nut first. Cut the thread off beyond the nut, then wind the thread past the end of the nut. If the thread binds while removing the nut, make sure the thread is not protruding past the nut and simply tap it against something solid to re-form the thread. In this case, because the bolt is now so short, it was easier to set it on the anvil of the vice and tap gently with a hammer. 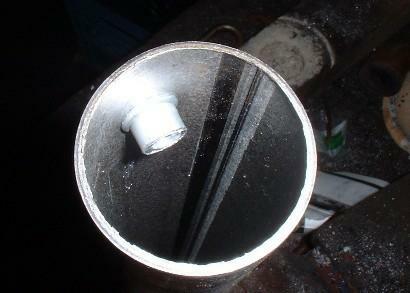 The trimmed bolt no longer protrudes into the pipe. In an effort to reduce any possible restriction, I tried cutting 1/2 the threaded portion of a riv-nut off before installing it. The threads stripped out before it fully mushroomed, resulting in this failed installation on the right. The insert is loose, but cannot be removed and there are no threads left to seal it! 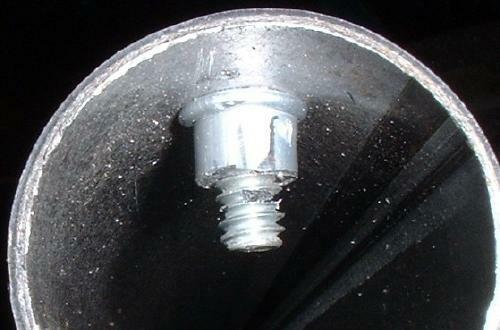 The full threaded length is required to properly install the insert. Following Fastwally's description of the procedure given his Yamaha dealer, we have all kind of been hung up on the riv-nut idea, myself included. With all due respect to Yamaha, I offer this option which has no restriction to exhaust flow. I drilled a 33/64" hole in the pipe, threaded a bolt through a nut, inserted the protruding thread through the hole, and welded the nut to the pipe. 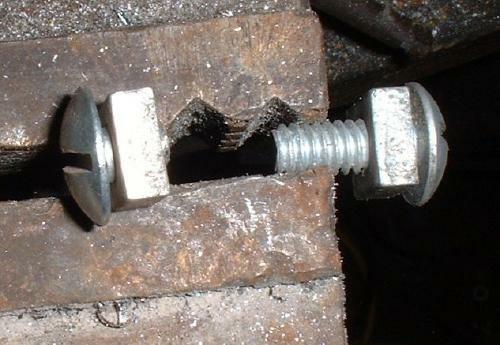 The bolt can then be withdrawn and cut to length. For the real thing, spring for a stainless nut. Caution: before arc welding on a motorcycle, unplug the ECU and disconnect the battery! 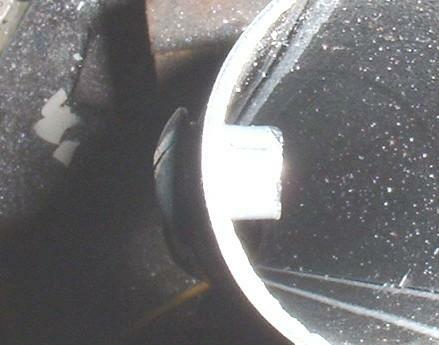 Also visible in this picture is a bolt installed in the riv-nut. Copyright © 2003, by H. Marc Lewis and Dwayne Verhey.